This review first appeared in the February 2016 issue of high-end hifi magazine fairaudio.de of Germany. You can also read this Tellurium Q review in its original German version. We publish its English translation in a mutual syndication arrangement with the publishers. As is customary for our own reviews, the writer's signature at review's end shows an e-mail address should you have questions or wish to send feedback. All images contained in this review are the property of fairaudio or Tellurium Q - Ed. Diamonds are a listener's best friend. A recent letter to fairaudio reminded me. They're still alive. No, I don't mean those flesh-eating zombies but still endless discussions about whether all cables sound the same or not. First to get sorted were speaker cables, then interconnects, finally power cords. But those intrepid enough to experiment and conclude that cables do make differences still face the stubborn fraction who insist that lamp cord or wired-up metal coat hangers suffice. Since the dark ages, insight into how diverse sonic parameters are influenced has grown of course. After all, we've now got the Internet, Uncle Google, are about to launch self-steering automobiles and are busy endowing computers with self awareness. But then, some audiophiles claim in all seriousness to hear differences with USB cables. I wonder how we'll look at them in a few years. To get to the point, the sonic influence of audio cables is more or less acknowledged today even if the exact how of it all is less so. In these days of hi-tech obsessiveness, we simply must acknowledge that the perfect coax or the one and only true speaker cable don't exist. What does are cables which conform with reasonable technical principles, are tested under various conditions and finally manufactured with due care. And that's what Brit cable house Tellurium Q are on about. Since 2012, our reviewing team has looked into the quality of their Green, Black and Graphite ranges and found much to admire about this newer brand from beautiful Somerset's Langport. Today is about their Black Diamond range which intends to repeat earlier successes at higher price points. Though still positioned below their Silver Diamond models, our contenders are already meant for well-balanced systems which won't lose their footing with some extra substance or colour. Exactly what model from Tellurium Q's catalogue will best suit a system obviously depends both on the hardware's finger print and the ears of its owner/s. Presently we have three colour hues or taste flavours. Blue is said to be warmer and more forgiving. Black is called very natural, dynamically responsive and well balanced. Silver gets a bit leaner and faster plus adds some resolution and particularly a very illuminated treble. Within these colour-coded ranges, there are quality and price steps. For example, black exists as Black, Ultra Black and our Black Diamond testers. For a detailed breakdown, consult their website. Here we are duly informed that this brand's focus is on the reduction of phase shift. That's sensible when degrees of phase rotation differ with frequency to result in signal that changes between input and output. These changes affect timbre and colour. 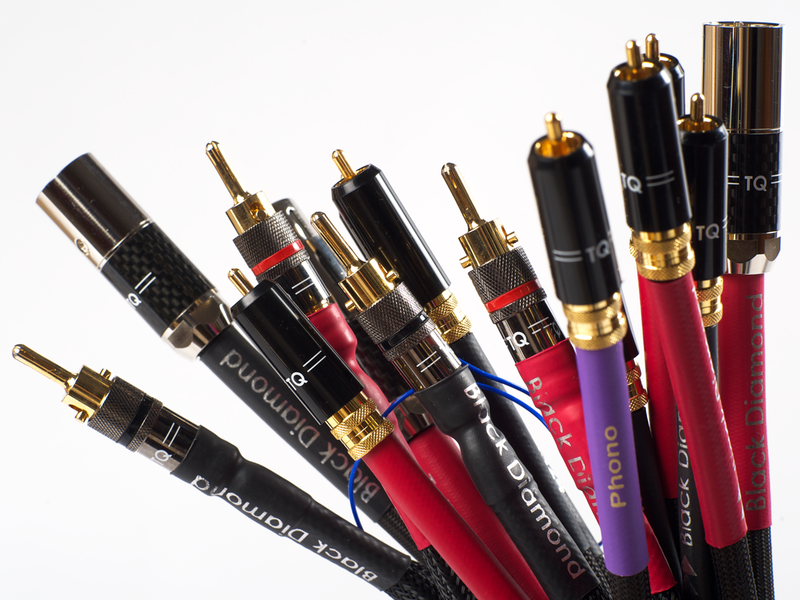 As is true for hifi components, phase and time fidelity are important for cables as well. None of this is new or comes as any surprise. Neither was I exactly shocked to find the Brit's flood of information concluding in a claim that their R&D led to a completely new view on cable connections and with it, discovery of previously unknown phenomena which, for obvious reasons, they don't mean to share with us. Right. De facto this means we learn very little of substance about their conductor, dielectric and geometry choices. It's a policy not that uncommon with cable makers yet here and there, exceptions exist. I remember the great candidness during my assignment of NordOst's Heimdall 2 range. Still, Arnd Rischmüller, owner of Tellurium Q's German H.E.A.R. 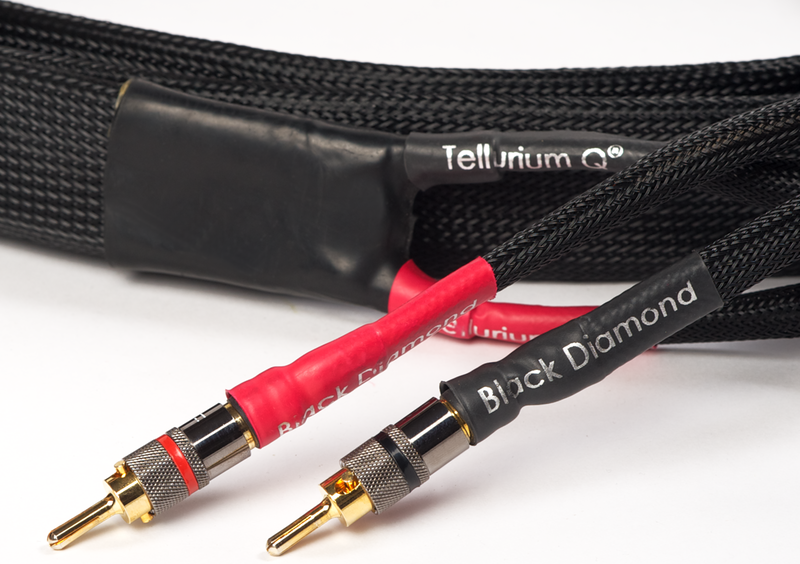 distribution firm, explained that Tellurium Q cables generally exhibit very low capacitance and inductance. Hence longer runs are less problematic as are dissimilar lengths between channels. This quite counters the philosophy behind my Magnan Vi cables where rising impedance is embraced to exploit minimized skin effect from an extremely thin bronze conductor. For my review auditions, H.E.A.R. 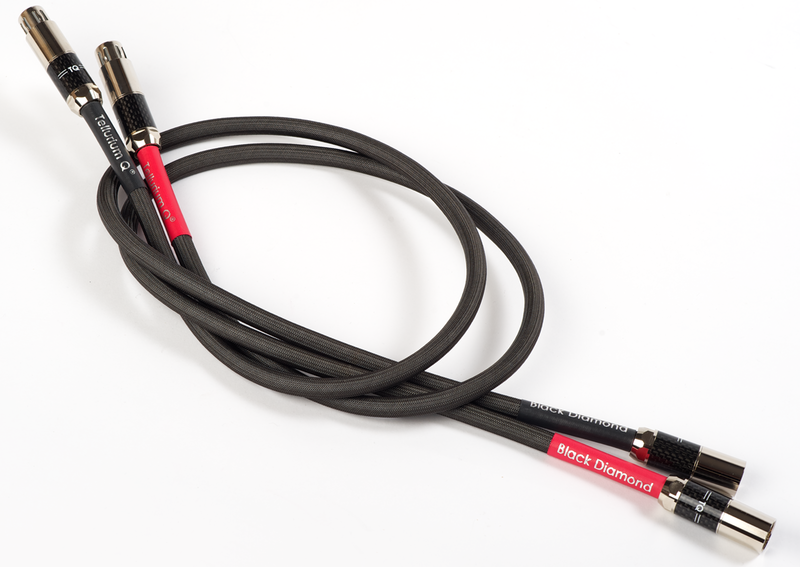 supplied 3-metre speaker cables, interconnects in RCA and XLR versions plus a phono cable. All arrived in high-gloss black boxes. Bygone seems to be the pragmatism of sending out costly cables in plain pizza boxes. Included was a Tellurium Q burn-in CD whose tracks are claimed to seriously shorten the usual limbering-up calisthenix. A very sensible and useful surprise, this! Black or anthracite-coloured synthetic weave sleeves all of these models with black shrink wrap around the ends. Where sensible, there are directionality markers. 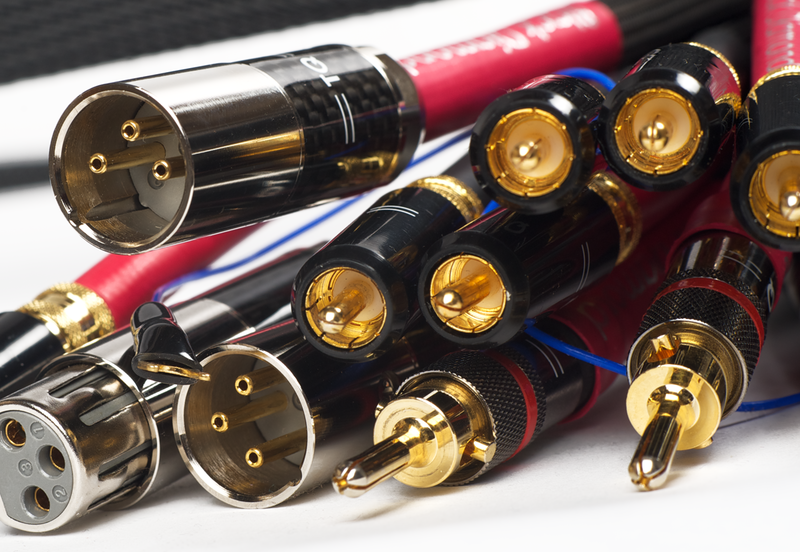 The banana, RCA and XLR connectors counter current trends to maximal mass/metal reduction by appearing quite heavy for a change. Early suspicions about Far Eastern connector origins which in this price range would be disappointing were quickly dispelled by Arnd Rischmüller's explanation that these are in-house issue built up of, nomen est omen, quality Tellurium copper. Special silver solder and exacting 450°C solder techniques promise long-term stability. To reduce micro resonances at these sensitive junctions, there are additional elastomeric dampers built in. By contrast to the earlier mentioned NordOst, the Brit wires strike one as a more basic build whilst the US competition feels more luxurious. Both are far removed from the nonchalant build of my Magnan cables. Pricing begins at €1'160 for a 1m RCA interconnect whose XLR equivalent wants €1'430. The phono cable demands €1'150. A standard 3-metre speaker pair wants €4'900. Other lengths are available for a surcharge. H.E.A.R. take pride explaining that these are global prices. This protects buyer investments and makes discounted imports from other parts of the world unlikely. My test rig begins with a TW-Acustics Raven AC turntable, Pyon Sound Iris SE arm and Einstein's The Turntable's Choice phono stage for analogue; and the Swedish multi-format Bladelius Gondul M player with RCA/XLR analog outputs for digital. An Accustic Arts Tube Preamp II-Mk2 or a passive/magnetic Classic Copper from Music First Audio interface with an Audionet Amp I V2 stereo amp recently fitted with AHP pure silver fuses. The British speaker cable contenders would slip in between that and Acapella LaCampanella speakers.